It’s amazing how quickly toddlers are able to say the names of many numbers, but the process of teaching them what the numbers actually mean can take quite a while longer. The understanding of numbers is of course crucially important for any child’s future education and life beyond, which is precisely why it is a process that cannot be rushed. As a parent, it’s perfectly possible to nurture and encourage a child’s understanding of numbers from an early age, simply by getting them interested in educational activities and games you can play at home. Teaching your kids numbers is easy. It’s a case of encouraging them to associate number with the things they see and do every day, while at the same time making the process as fun as possible. The most important advice of all is to never rush the process and to accept that it may be a few years before a genuine understanding begins to set in, but it will indeed set in given time. It’s a good idea to begin introducing numbers to children as soon as their first birthday rolls around. Just the simplest of statements –“One tree, two cats” and so on, can make them realize that numbers are associated with real life object or pictures. Songs are also great – anything like “Ten Green Bottles” or “Three Blind Mice” – as they’re much more memorable. After 24 months, it’s possible that a child will be able to count to ten, but chances are this will be from memory rather than actually understanding what the numbers mean. At this stage it’s important to use every available opportunity to bring numbers into everyday life and everything you do. Two shoes, one dog, three apples and so on and so forth – it will take a whole to get the message across, but using this kind of visual reference is the key to communicating the meaning of the numbers, rather than just the sounds. Between the ages of three and four years, you can take things one step further to begin adding and subtracting quantities of the visual number references you’ve been using. You could for example show your child three bananas, and then take one away to become two. Or perhaps you could use building blocks to show addition and subtraction – not that they’ll understand the principles of the mathematics, but they’ll continue to associate numbers with object in everyday life. In terms of written numbers, it’s not uncommon for kids not to understand or be able to write any numbers until the age of 5. Simply keep an eye out for all the numbers that exist in and around your neighborhood, making sure to bring them to the attention of your child. From buses to house numbers to advertising posters and so much more, read them all out loud and point them out to your child as you do so. Cleaning up can become a math lesson simply by counting along with all the toys you put away. A little further down the line, you can ask them to pass you two items, put away one toy and so on and so forth to test their progress. They’ll learn and repeat by memory only in the early years, but it still gets the names of number absorbed and remembered. When singing nursery rhymes and kiddy songs that involve numbers, use your fingers as visual references. By doing so, your child will see that nine green bottle for example are less than ten. It’s a tricky one to nail, but if there’s one set of numbers you can get your child to remember, make it your phone number in case they every get lost. Try making into a song, a rhyme or a limerick. Invest in a chalkboard or maybe just a set of washable pavement chalks and you have all you need for a brilliant number game. It’s a case of creating a simple connect the dots pattern by drawing a series of dots in any given shape and numbering them one to ten. In no time at all, you child will begin to understand which number follows the last and will associate the counting process with the reward of drawing a fun picture. All building blocks are just perfect for teaching number and really, what kid doesn’t love playing with Lego? Try creating a graph or table with ten numbered boxes, in which you can ask your child to put the corresponding number of blocks to communicate the difference between each figure. Or you could of course just encourage them to count as they build. 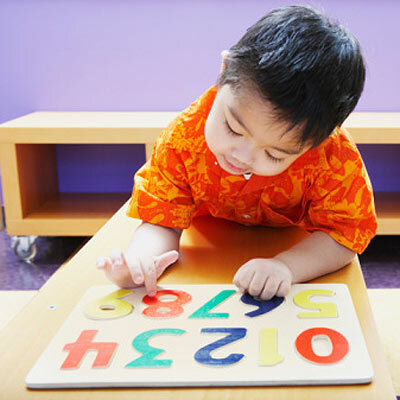 Bring the numbers themselves to life by encouraging your child to paint them in bright colors. This is one of the best ways of bringing interactivity to the learning process and ensuring that your child has a blast while developing important knowledge. There are plenty of kids’ books on the market that have been designed specifically to assist with the teaching of numbers. Examples like "1, 2, 3 to the Zoo: A Counting Book" by Eric Carle and "How Do Dinosaurs Count to Ten?" by Jane Yolen are ideal for making the learning process as fun an memorable as possible. Or better still, bind a series of pages together and on each page write a number. Next, ask your child to draw anything they can think of in the quantity specified, so on the page where you write the number three, they can draw 3X times anything they like.